Fruit Ninja: Puss in Boots is an unfortunate sequel in that it does very little to improve on the original Fruit Ninja game. That doesn’t mean it’s not a good game; it’s just not all that exciting. But hey, it’s got a film character and Antonio Banderas’ voice in it, if that does it for you. That’s about as far as the connection to the new Puss in Boots film extends, though. The app comes with two modes, Desperado and Bandito. 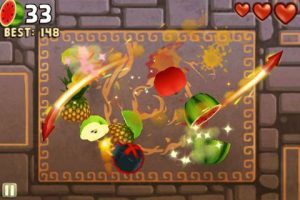 In Desperado, fruit and bombs fly into view from the bottom of the screen; you need to slice fruit by swiping through it and avoid hitting bombs (if you do, you lose one of your three lives. Lose all three lives and it’s game over). Each fruit that you swipe through earns you a point, whilst hitting several pieces of fruit in the same swipe scores extra points. There are a few other ways to gather extra points too. If you’ve played the first Fruit Ninja, nothing here will sound new – because very little is. This is almost exactly the same as classic mode in the original game, just very slightly ‘enhanced’. Meanwhile, Bandito does bring something fresh to the table. It’s essentially a challenge mode full of mini games, played through on three difficulty tiers. When you choose the mode, you are randomly selected four games to play through at the easiest difficulty. If you have at least one life left after completing these games (lives are lost by failing a game), you’ll progress to the next difficulty level, and so on until you’ve played through twelve mini games. Then, you play a ‘finale’: you hit a piñata, smashing it as much as you can before the time runs out. If you swipe and miss the piñata, the screen darkens. If you miss too often, the screen turns black and the finale is over. The more you hit the piñata, the more points you get. The aim of Bandito is to score as many points as possible by the time you’ve completed all the challenges, with extra points awarded according to the number of lives that you have left at the end. The mini games themselves involve different permutations of the fruit slicing mechanic: slicing it as it falls from different areas of the screen; as it is flies between bombs; when it is supersized and needs slicing down into smaller chunks, and more. After a few plays through the mode you’ll be familiar with all of the different game types, though they’re short enough and there are enough of them that they take quite a while to begin to feel repetitive. Of the two modes, Bandito is really the only one worth purchasing the game for if you already own the original game. Overall, Fruit Ninja: Puss in Boots lacks enough exciting content to make it really easy to recommend. It’s got a different theme to the original, given its connection to a film, and one new mode. The graphics, of course, are as good as the original, and there are still achievements and so on to keep you playing. The question is whether you want to cough up 99 cents for one new mode – and that’s something for you to decide. With any luck, more modes will be added to the game in the future.